Can Women Do Body Beast? - Try Body Beast For FREE! Can Women Do Body Beast? Of Course Women Can Do Body Beast! Try Body Beast For FREE… Click Here! As you can see from Shanda’s Body Beast results in the image above, the program completely changed her body. She looks amazing and this should be all of the proof you need to affirm that Body Beast is not just for men. Is Body Beast For Women?… Will Body Beast Make Me Too “Bulky”? This is a great question and I understand a woman’s fear of becoming too muscular. While a little definition is great on women, I doubt you’ll want your boyfriend asking you to open the jar of pickles for him. There is a point where muscles can get too big on a women, but getting to this point is very hard to do without hormone supplements. Generally women don’t have the muscle building hormones that men do so they are unable to bulk up like men do. When you see a women who is big and bulky like a man, there is probably some sort of hormone supplement involved. Also, Body Beast can be customized to the individual’s own goals, depending on if you want to bulk up, or just burn fat and get lean muscles. Body Beast comes with a “Lean Schedule” that is geared towards getting lean and cut. SEE ALSO: How Does Body Beast Work? 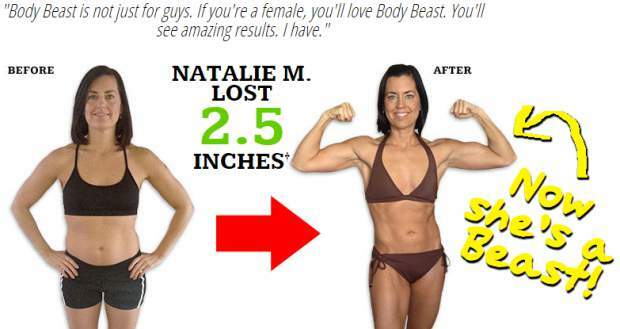 If you’re a woman that wants to do Body Beast, my advice is to “Go For It”, you’ll will get amazing results! If you’re still not convinced that you need to lift weights, here are 10 reasons to reconsider. Burn more fat. Researchers at Tufts University found that when overweight women lifted heavy weights twice a week, they lost an average of 14.6 pounds of fat and gained 1.4 pounds of muscle. The control group, women who dieted but didn’t lift weights, lost only 9.2 pounds of fat and gained no muscle. When you do an intense weight-training program such as Body Beast, your metabolism stays elevated and you continue to burn fat for several hours afterward. During regular cardio exercise, you stop burning fat shortly after the workout. Change your body shape. You may think your genes determine how you look. That’s not necessarily true. Weight training can slim you down, create new curves, and help avoid the “middle-age spread.” Just look at the amazing body transformations of the women who have completed Body Beast. Dropping only 3 percent of your body fat could translate into a total loss of 3 inches off your hips and thighs. And no, you won’t bulk up—women don’t have enough muscle-building hormones to gain a lot of mass like men do. If you keep your diet clean and create a calorie deficit, you’ll burn fat. Boost your metabolism. The less muscle you have, the slower your metabolism will be. As women age, they lose muscle at increasing rates, especially after the age of 40. When you diet without doing resistance training, up to 25 percent of the weight loss may be muscle loss. Weight training while dieting can help you preserve and even rebuild muscle fibers. The more lean mass you have, the higher your metabolism will be and the more calories you’ll burn all day long. Get stronger and more confident. Lifting weights increases functional fitness, which makes everyday tasks such as carrying children, lifting grocery bags, and picking up heavy suitcases much easier. According to the Mayo Clinic, regular weight training can make you 50 percent stronger in 6 months. Being strong is also empowering. Not only does it improve your physical activities, it builds emotional strength by boosting self-esteem and confidence. Build strong bones. It’s been well documented that women need to do weight-bearing exercise to build and maintain bone mass, and prevent osteoporosis. Just as muscles get stronger and bigger with use, so do bones when they’re made to bear weight. Stronger bones and increased muscle mass also lead to better flexibility and balance, which is especially important for women as they age. Fight depression. You’ve pprobably heard that cardio and low-impact exercises such as yoga help alleviate depression, and weight lifting has the same effect. The endorphins that are released during aerobic activities are also present during resistance training. Many women find that regular strength training, in conjunction with psychological treatment, helps lessen their depression symptoms substantially. Improve sports fitness. You don’t have to be an athlete to get the sports benefit of weight training. Improved muscle mass and strength will help you in all physical activities, whether it’s bicycling with the family, swimming, golfing, or skiing . . . whatever sport you enjoy. Reduce injuries and arthritis. Weight lifting improves joint stability and builds stronger ligaments and tendons. Training safely and with proper form can help decrease the likelihood of injuries in your daily life. It can also improve physical function in people with arthritis. A study conducted at the University of Wales in Bangor, United Kingdom, found that mildly disabled participants who lifted weights for 12 weeks increased the frequency and intensity at which they could work, with less pain and increased range of movement. Heart health. More than 480,000 women die from cardiovascular disease each year, making it the number-one killer of women over the age of 25. Most people don’t realize that pumping iron can also keep your heart pumping. Lifting weights increases your “good” (HDL) cholesterol and decreases your “bad” (LDL) cholesterol. It also lowers your blood pressure. The Journal of the American Medical Association reports that people who do 30 minutes of weight lifting each week have a 23 percent reduced risk of developing heart disease compared to those who don’t lift weights. Defend against diabetes. In addition to keeping your ticker strong, weight training can improve glucose utilization (the way your body processes sugar) by as much as 23 percent. According to the Centers for Disease Control and Prevention, 16 weeks of strength training can improve glucose metabolism in a way that is comparable to taking diabetes medication. The more lean mass you have, the more efficient your body is at removing glucose from the blood, which can reduce complications from diabetes or even help prevent type 2 diabetes in the first place.